Welcome to the four hundred and forty-sixth of my blog interviews with novelists, poets, short story authors, biographers, agents, publishers and more. Today’s is with fantasy author Lisa Beavers aka Lola Lyons. A list of interviewees (blogged and scheduled) can be found here. If you like what you read, please do go and investigate further. Morgen: Hello, Lisa. Please tell us something about yourself, where you’re based, and how you came to be a writer. Lisa: My name is Lisa Beavers, and I’m based out of the beautiful smokey mountains in Knoxville, Tennessee. I don’t think you ‘become’ a writer… I think you are born one and eventually you just learn how to deal with it (and sometimes let the rest of the world in on the secret). I started writing stories and poetry at the age of 8. From my mid 20’s to my late 30’s, I didn’t write anything fun or interesting, just boring work stuff. However, when I started my own business and ‘became’ an entrepreneur, it started up the desire to write again. I’m old enough and wise enough now to ignore anybody who tells me that I can’t do it. I know I can! Morgen: Me too. 🙂 What genre do you generally write and have you considered other genres? Lisa: I have always stayed in the fantasy realm – magic and dragon and faeries. I have really loved the new turn that fantasy has taken, bring more of the myth into the real world. Supernatural / paranormal urban fantasy is definitely my niche. I love to read it and I love to write it. I’m always open to any form of writing, but whenever given the choice, I think this is where I’ll end up. Morgen: I thought you had to read what you write but have a brilliant (70-something) writer in one of my writing groups who writes amazing science fiction and she says she’d never read a word of it! What have you had published to-date? Do you write under a pseudonym? Lisa: I do write under a pseudonym, Lola Lyons. I do that so that I can keep the fiction writing separate from the non-fiction work I plan to do under Lisa Beavers. Morgen: Lola it is. 🙂 Have you had any rejections? If so, how do you deal with them? Lola: I have had a lot of rejections. When I was about 15, I submitted a short story to a very big science fiction magazine. The letter I got back actually said the story was really good, it just wasn’t quite in their area (it was more fantasy). But they sent that letter believing I was a grown up writer, not just a 15-year-old kid, and I’ve always been very proud of that rejection. I don’t pay a lot of attention to rejections. Morgen: 🙂 Good plan, as you said just the right thing for the wrong person. Have you won or been shortlisted in any competitions? Lola: I won a national poetry competition when I was in high school, and I’ve won some awards for my graphic design work. Lola: I do not have an agent, and I am not particularly interested in having one. I think the only things vital to an author’s success are 1) the ability to write and 2) the ability to build a market of people to buy what you write. If you are not good at the first, you might want to pursue a different career. If you are not good at the second, all you have to do is build a good support team, and an agent may or may not be involved in that. I have a lot of marketing experience to help me. Morgen: You’re fortunate, marketing is usually the answer to my ‘what’s your least favourite aspect of writing?’. Are your books available as eBooks? Were you involved in that process at all? Do you read eBooks or is it paper all the way? Lola: The book, The House on Evermore Lane, is the first book in the Graves Grimoires. It will be available as an ebook on Amazon later this autumn, and it will also be available through the Amazon lending program. I will be doing small paperback runs based on market demand, so a physical copy will be available sometime around the end of the year. Lola: I will do the great deal of my own marketing. I have a PR firm, a Dalton-Dupes Agency, to help me. This is a premier agency in Knoxville, and they specialize in working with women business owners. I am very pleased with their work, and would highly suggest them to anyone. My background in marketing and graphic design play a huge role in my ability to take a large portion of the marketing on myself. Morgen: Do you have a favourite of your books or characters? If any of your books were made into films, who would you have as the leading actor/s? Lola: Wow, it would be hard to pick just one. As Mina is the main character, I am tempted to say that she is the dearest to my heart – but honestly, I think she’s just a little too much like me for that. Of all my characters I particularly adore Daisy (the somewhat eccentric and flighty sidekick) and Bing. Bing reminds me of someone very dear to my heart. Morgen: 🙂 Did you have any say in the titles / covers of your book? How important do you think they are? Lola: I think the title and cover are what sells a book. You need an excellent title and an eye-catching cover design. I have complete control over my title and cover, and worked on both of them for a very long time before I was happy with them. Morgen: Your cover is certainly eye-catching. 🙂 You mentioned your book being first in a series, what are you working on at the moment / next? Lola: I am roughing out the storyline for the next book in the Graves Grimoires, tentatively entitled Black (and Blue) Magic. Morgen: Do you manage to write every day? Do you ever suffer from writer’s block? Lola: I attempt to write every day, but it’s not always in my book. Sometimes it’s in the blog or just in notes. It all builds together in my head to create the story. When I do sit down and write sections of the story, they will have meshed enough in my head to simply flow onto the page. Absolutely I suffer from writer’s blocks, and storyline blocks, and sheer laziness blocks as well. I’ve had several moments with the storyline when it was difficult to figure out how to move the storyline in the direction I wanted it to go, without giving up any of the scenes I wanted to see, and without making it sound off or clunky. Morgen: “laziness blocks” that’s funny. It sounds like you plot your stories, in your head anyway, or do you just get an idea and run with it? Lola: I get an idea and run with it. But I run with it (writing) and plot out storyline at the same time. I have author friends who have to sit down and detail out everything before they start writing. Me, I drove my English teachers nuts because I always wrote the outline after I wrote the paper. It’s a combination, but it’s a very fluid and flexible process. Morgen: Writing the outline after writing I’d say isn’t a bad thing as it can often help form the synopsis. Do you have a method for creating your characters, their names and what do you think makes them believable? Lola: My characters tend to pop into my head and introduce themselves fully-formed… and then start making demands to either be written about individually or included in existing storylines. Esme and Bing for example, were not planned characters in The House on Evermore Lane. They simply added themselves in. Morgen: Don’t you just love that. 🙂 Do you write any poetry? If so, why do you think it’s such a difficult market to break into? Are there any tips you could give to someone wishing to write poetry? Lola: I do write poetry. I love the flow and feel of it, and the way you can convey a specific moment or emotion with a few choice words. I don’t, however, write for publication. I write it just because it’s a fun outlet for me. I think poetry is highly subjective, and there isn’t a lot of money in publishing it, which makes it hard for publishing houses to venture out and take chances on new poets becoming profitable. The only tip I have is write what you love. Morgen: Absolutely, and (hopefully) love what you write. Do you write any non-fiction or short stories? Morgen: I’m the opposite; mine are getting shorter and shorter (yesterday’s being 44 words!). Do you do a lot of editing or do you find that as time goes on your writing is more fully-formed? Lola: I find that as I get older, my writing is much more ‘me’; that I let more of myself show and I stop worrying about whether people will like it or not. I’ve had a lot more experience in life now than I did when I was a teenager or young adult, and I think that shows in my writing. I still do a lot of editing, but that tends to be adding things in instead of taking things out or changing them. Morgen: The great thing about eBooks is that as long as a story is well-written (you would hope) someone out there will like it. 🙂 Do you have to do much research? Morgen: 🙂 What point of view do you find most to your liking: first person or third person? Have you ever tried second person? Lola: I used to write exclusively in third person. The House on Evermore Lane started out in third person. Somewhere around the third re-write of the first 10K words, the story solidified for me, and it explained to me in no uncertain terms that the only way to tell it was in first person. So this is my first effort at it. I have not tried in second person, although the way Mina thinks occasionally has that “second person” feel about it. Morgen: Ooh, how intriguing. Do you have pieces of work that you think will never see light of day? Lola: I certainly have some that never should have seen the light of day and did, LOL. When I first started the idea of writing again, and played with the concept of ebooks and print on demand, I used an old old old manuscript (I was 19 when I wrote it) as a test book. I didn’t market it, just used to figure out how amazon and some other sites worked. I think eleven people bought the book, and to each of you, I offer a hearty apology. It was really bad. Morgen: Oh dear… you never know, maybe they liked it. What’s your favourite aspect of your writing life? Lola: The constant creation, the springing forth of new ideas, new twists and turns, new characters. Building my own little worlds and people to live in them. Morgen: Me too. 🙂 What advice would you give aspiring writers? Lola: Write. Write, write, write, write. Find mentors and learn everything you can from them. Then go write a whole bunch more. Eventually one of two things will happen – you’ll choose writing as your career and find ways to make money doing it, or you’ll decide it isn’t the life for you and move on. You either are or aren’t a writer; there is no grey area. Morgen: If you could invite three people from any era to dinner, who would you choose and what would you cook (or hide the takeaway containers)? Lola: As much as I love my authors, I wouldn’t pick one for this dinner. I’m selfish and would want the spotlight of being the ONLY author at this fabulous table. I’d love for one to be Albert Einstein, one to be Cleopatra and one to be Frank Lloyd Wright or Leonardo da Vinci. I’d have a hard time choosing between the two of them. There would be no cooking by me, but a wonderful hours-long catered meal with a dozen different courses of food, with everything from salsa verde and chips to peach bellinis to tender steak, and we’d have to wrap it up with a rich chocolate cake or key lime bars and dark chocolaty coffee with real cream and sugar. Morgen: Buffets are my favourite type of food (especially from different countries) and your choices sound yummy. Is there a word, phrase or quote you like? Lola: “Just sayin’” and “Right”. Lola: I do copywriting for some of my clients, and often write or rewrite emails or articles for them. I do a regular column in Knoxville Parties and More magazine called “The Party Diva” where I provide diva-licious answers to event-related questions. Lola: Writing is, sadly, not my full time occupation at the moment. I own and run a graphic design and printing company which takes up a great deal of my time, and have another company that I am working to get off the ground in the next year. Other than that, I torment my 26-year-old son. I read voraciously, I play chess, I hang out with my friends, and I spend time driving very very fast down windy country backroads as often as possible. Morgen: Are there any writing-related websites and/or books that you find useful? Lola: I have enjoyed Smashwords; I was able to get some really good feedback there on rough spots in the manuscript. I have several books and websites on writing that I visit regularly. I do spend a bit of time in the writing forums and groups on linkedin, and I subscribe to several blogs. Morgen: I’ve had wonderful feedback on Smashwords too. I’ve been giving a tough time with reviews on Goodreads so far, although get loads of friend requests, which is great and I live in hope that some of them will read my eBooks and balance things up a little. 🙂 Are you on any forums or networking sites? If so, how valuable do you find them? Lola: I am in multiple writing groups on LinkedIn, and I belong to a networking group called REO for my graphic design company. I belong to some groups on other social media like Facebook as well. I think I enjoy the groups on LinkedIn the most, that’s where I learn the most. But I think the groups are good as a whole. You can use them to learn, build relationships, and help create your brand awareness. Just don’t give in to the temptation to market your book relentlessly and not learn, help others, or build honest-to-goodness relationships with other members. That’s a good way to get kicked out. Morgen: It is, and de-followed on Twitter. LinkedIn’s been brilliant for these interviews; keeping me topped up (I’m currently booking into April 2013) when I was getting low earlier this year. What do you think the future holds for a writer? I think we are going to see some substantial shifts in how we market and publish materials. I think the publishing houses will lose market share to self-publishing. I hope to see some of them transition to service-based houses for self-publishing authors who provide an a la carte system of services and products, much like you see on Createspace and Lulu, because they have some very good, very experienced people who can help new and growing authors tremendously. We are not all meant to market or research printing, or edit, or design covers. I think ebooks are going to grow and grow big. I don’t think paper books will become a thing of the past, but I think we will see fewer bookstores and more libraries instead of more bookstores and fewer libraries as the locations where we obtain said paper books. Social media is opening up a whole new world for us introverted authors… allowing us to connect on a one-to-one basis with our fans and engage them in our stories from word one. I think you are going to see a lot more of authors and fans connecting over books and book news without the intermediaries of agents, publicists and book signings. Morgen: Our libraries in the UK have been under threat for a while so I hope you’re right, although we only have one bookshop (Waterstones) where I live so I hope that stays, especially as one of my novels is set here. 🙂 Where can we find out about you and your work? Lola: I have a website (http://lolalyons.com) and you can visit me on Facebook (lola lyons) or on my fan page (lola-lyons), and I’m on twitter as lolalyonswrites. You can find Evermore Lane memorabilia (shirts, mugs, etc) at my zazzle store, www.zazzle.com/littleshopofwonders. Lola: I’d like to extend my thanks to you for allowing me this interview and space on your blog. It’s been wonderful, connecting with authors of all types, and I look forward to meeting many more. Morgen: You’re really welcome (“allowing” by the way is a very low requirement; I think that if a writer writes, they have something to say). 🙂 It’s been a pleasure chatting with you. Is there anything you’d like to ask me? Lola: You have a substantial portfolio of author spotlights / interviews. What do you like best about getting in their heads and learning about them and their writing? What is it that motivates you to help pull us out of our stories and put us into the hands of those who would love our stories as soon as they know enough about them to read them? Morgen: Apart from just loving to talk about anything writing-related it’s made me realise how many authors there are out there who are, like me, fairly early in their writing journey, publication-wise anyway, and if I can help them then it’s very rewarding… and if I get helped in the process too, that’s a bonus. 🙂 Thank you, Lola… Lisa. Lola: No, thank you. It’s a pleasure and an honor. I wasn’t all the way awake when I felt the slap of paws against my face. The house left wolf-boy in, Max complained, poking at me with his little kitten claws. “If I throw you out the window, will it let you back in?” I grumbled, pushing him away. Fine stay in bed, Max retorted, jumping back off the bed. But he’s cooking. Cooking? Hhhhmm, that might be worth getting up for. My stomach rumbled agreement. I grabbed a ponytail holder and put my hair up in a lazy knot. Good smells lingered in the hallway, the warmth of butter and batter and cinnamon. French toast? I think, that if something is going to happen in your life that will flip it and you inside out, you should get a little warning. Had I know that by the end of the day my house would be burned to the ground, the Big Bad would be chasing me and I would be Savannah’s newest witch, well, at the very least I would have dressed differently. Possibly hidden under my bed refusing to come out. Now I’m in Savannah, living in a magic house that won’t give me ice cream, with a talking cat and a voodoo queen’s ghost. I’ve just found out I’m not who I thought I was, and a magic spell was what made me forget me… and kept me alive and hidden from the Big Bad and my father… the ever-so-slightly-insane King of the Wild Hunt. Did I mention that all those fairy tale creatures you’ve read about are REAL, and every last one of them is chasing the reward my father has on my head — whether it’s attached to my body or not? Lola Lyons is a dreamer and a writaholic. She cannot remember a time in her life that didn’t involve reading, and few that didn’t involve writing. A quiet child, she preferred the world of books and imagination to the one of people and noise. For many years, she relegated her writing to a ‘hobby’ instead of being brave enough to put it out there for the world, and spent many years working as a graphic designer. Writing is her first love, and she’s discovered that, in the digital age, it’s much easier to publish work, sell novels, and interact with fans. She’s amazed at the changes self-publishing and ebooks have made. 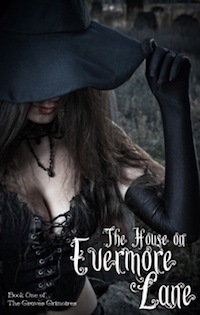 Her new novel, The House on Evermore Lane, the first book in the Graves Grimoires series, will be available for purchase later this year on Amazon. Visit her website www.lolalyons.com.